Hey everyone, happy Thanksgiving, and as an early holiday gift, I'm sharing with you a link to a great article I really enjoyed this week from Real Simple, where 7 authors share their favorite Thanksgiving traditions. Surprisingly, they're not all about eating! Authors and foodies include some of my favorites, including Garrison Keillor, Allegra Goodman, Frank Bruni, and others. 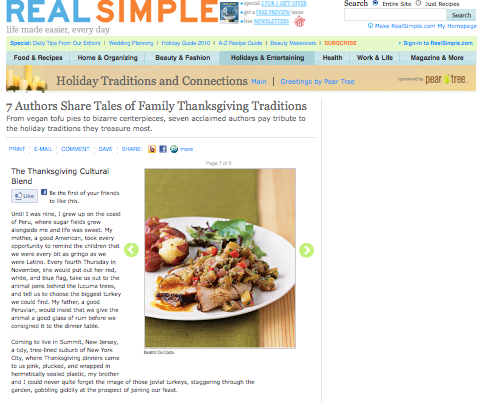 http://www.facebook.com/carriecommunications, where I've been posting "7 Days of Cool Holiday Links," including some unusual, finds, like George Carlin's infamous monologue on "Too Much Stuff," as well as a link to Frank Bruni's New York Times Thanksgiving dish video library. I also included one of my new favorite bloggers, Barrie Davenport, who publishes "Live Bold & Bloom," and posted a great piece this week, "In the Face of Holiday Chaos, Take a Stand for Simplicity." I'll still be posting some surprises through Friday, including a great link for online cards, as well as a musical favorite we all know and love! So join me, and feel free to comment and share your favorite links.